The use of cottage homes for housing 'problem' children was pioneered at an 'agricultural colony' for delinquent boys at Mettray, near Paris, in the 1840s and 1850s. The homes, or pavilions, organised on the basis of 'family' groups, proved successful in providing a remedial environment for juvenile offenders. Mettray Homes, 29th July, 1872. The idea was then taken up by a number of organisations in Britain, amongst the first being the Princess Mary's Village Homes for Little Girls, at Addlestone in Surrey in 1871. Usually built in rural locations, cottage home schemes were based on the idea of a 'village' of small houses (often set around a green or along a street) each home accommodating 'families' of between twelve and thirty children. As well as a houses and a school, larger cottage home sites could include workshops, an infirmary, chapel, and even a swimming pool. Princess Mary's Village Homes, c.1906. For Poor Law Unions, cottage homes offered pauper children an alternative to the physical conditions and 'malign influence' of the workhouse accommodation. Between 1874 and 1878, encouraged by Mrs Nassau Senior, the first female poor-law inspector, the unions of West Derby, West Ham and Bolton experimented with cottage home accommodation. In the first two instances, the homes were erected on existing workhouse sites, each house accommodating around 50 children. 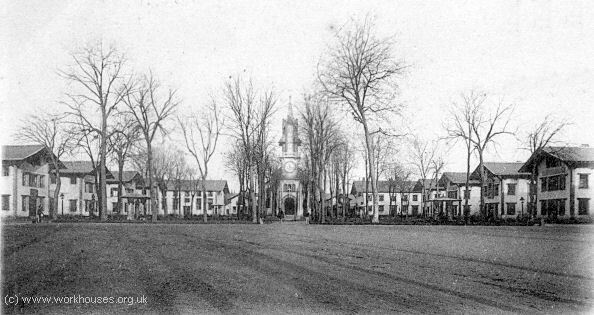 Bolton's approach was more in line with the cottage homes ideal and comprised four smaller houses, each accommodating thirty children, and a school built around a central green, although again still adjacent to the main workhouse site. The earliest 'true' cottage home sites in the poor law system were established in South Wales at Swansea (opened 1877), Neath (1878), and Bridgend (1879). These were followed in England by Birmingham (1879) and the Kensingston and Chelsea School District (1880). Bridgend cottage homes from the south. Instead of the 'village green' layout, some cottage homes were arranged in the style of a 'street' such as those at Banstead, Aston, and Hornchurch. Shoreditch Hornchurch cottage homes site, 1920. In additions to their classroom lessons, the children were taught practical skills to make them employable after leaving the homes. For girls, this included domestic skills such as needlework and cookery. The boys could be taught trades such as carpentry, shoemaking and plumbing. 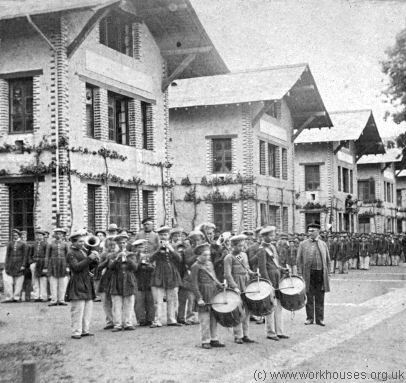 Homes also often had a boys' band, membership of which could sometimes lead to a later career as a military bandsman. Some cottage home developments were enormous, such as the Poplar Union's site at Hutton, the Salford Union's homes at Culcheth, Newcastle-upon-Tyne homes at Ponteland, or the Hackney Union's site at Chipping Ongar. Others were often on a very modest scale, perhaps just two or three houses on sites adjacent or near to the main workhouse, for example as happened at Burnley, Bolton, Lanchester, Basford, Pontypool, and Auckland. Hackney cottage homes sports and inspection day, 1913. In the 1880s, several London authorities tried to combine the traditional barrack school with the newly popular cottage home. Bethnal Green's school site at Leytonstone, erected in 1881-2, had six large and closely-packed 'homes' arranged either side of a central dining-hall. The architect of Edmonton Union's Chase Farm Schools, erected in 1884-6, offered the Guardians two plans, one based on cottage homes, the other using large pavilion blocks. The Board opted for the latter but included two cottage homes at the rear of the site. Edmonton Chase Farm Schools, 2004. Examples of surviving cottage home sites can be seen at Ponteland, Fazakerley, Culcheth, Padgate, Countesthorpe, Aston, Hornchurch, Elham, Stoke-upon-Trent, Chipping Ongar, and Sidcup. Cottage homes were not without their critics who saw them as isolating children from the real world and not preparing them for the life they would have to lead after leaving the homes. The scattered homes system was developed as an alternative system which tried to deal with these problems. Morrison, Kathryn (1999) The Workhouse, English Heritage.